Leicester City manager Claudio Ranieri says he does not want to be woken up from his Premier League title dream. The Foxes are five points clear of Tottenham at the top of the table, following Saturday's 3-1 win over Manchester City at Etihad Stadium. 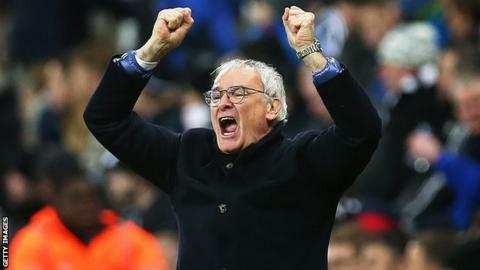 Ranieri, 64, insists his players are not feeling the tension even though his team are now the bookmakers' favourites to win the Premier League title. "It's a great story so why the pressure? Let's enjoy," he said. "I hope the bookmakers, this time, are right but I am very pragmatic. "Give me points and not words. We want to continue to dream - nobody wake us up, please." Leicester have lost only two out of 25 games in the Premier League this season, and the Italian says says a top-four finish would be "fantastic" for a club who were 5,000-1 shots to win the Premier League before the start of the season. "It's a 12-point gap [to Manchester United in fifth place] and for us to achieve the Champions League would be fantastic," he said. Leicester next meet third-placed Arsenal at Emirates Stadium on Sunday, and the Foxes then have a 13-day break before a Premier League home fixture against Norwich City on 27 February.